Mumbai: Airports overseas offer incentives and rebates to attract airlines in contrast with Indian rivals that are raising charges to maximize returns at a time when airlines are operating on thin margins, said aviation experts and executives at various international airports. They spoke to Mint on the sidelines of the Routes Asia seminar in Mumbai organized by the GVK Group last week. New airlines operating from Incheon airport in South Korea, for instance, don’t have to pay for a year, said Daniel Dongik Shin, director, aviation marketing team. “They will get a 75% concession for the second year and 50% for the third. If an existing airline adds a new destination from our airport, we offer similar discounts. For increasing frequencies on existing routes, we give 50% discount on landing charges," he added. State-owned Incheon international airport is the largest in South Korea, handling 44 million passengers a year. For seven successive years (till 2012), it was rated the best airport worldwide by the Airports Council International lobby group. The airport has a “generous incentivization programme with discounts and two-year rebates on landing charges for two years for new airlines", said Luis E. Perez, vice-president, air service development, DFW International Airport. “We have a $60,000 marketing fund for airlines to promote the airport as a new destination for the first year. And if it’s a new airline, we have $250,000 for marketing assistance and another $150,000 to promote the destination. And we are a profitable airport," said Perez. Cambodia has three airports and all are run by France’s Group Vinci and Malaysian company Muhibbah Masteron Cambodia. The airports handle four million passengers a year. Most Indian airports are going the opposite way. The Indira Gandhi International Airport, run by GMR Group’s Delhi International Airport (Pvt.) Ltd, was allowed to increase aeronautical charges by 346%, effective 15 May 2012, against a demand for a 775% hike, by the Airports Economic Regulatory Authority (Aera). The move was opposed by many airlines and the International Air Transport Association, or Iata, lobby group which said the charges would make Delhi the world’s most expensive airport. Similarly, the Chhatrapati Shivaji International Airport in Mumbai, run by GVK Group’s Mumbai International Airport (Pvt.) Ltd, got approval for a 164% increase in revenue from aeronautical charges effective 1 February against a demand for an increase of 881%. Kolkata’s Netaji Subhas Chandra Bose International Airport got approval to raise aeronautical charges by 219% effective 16 February and a further 52% from 1 April. That’s an effective 385% increase from 2011-12. Aera has also given the Chennai International Airport approval to increase aeronautical charges by 141% from 1 March followed by a further 53% increase from 1 April. This will be a 269% increase from 2011-12. Both Chennai and Kolkata airports are run by state-run Airports Authority of India, or AAI. The privately-run airports of Bangalore (run by the GVK Group) and Hyderabad (run by the GMR Group) are expected to make similarly steep increases in airport charges. 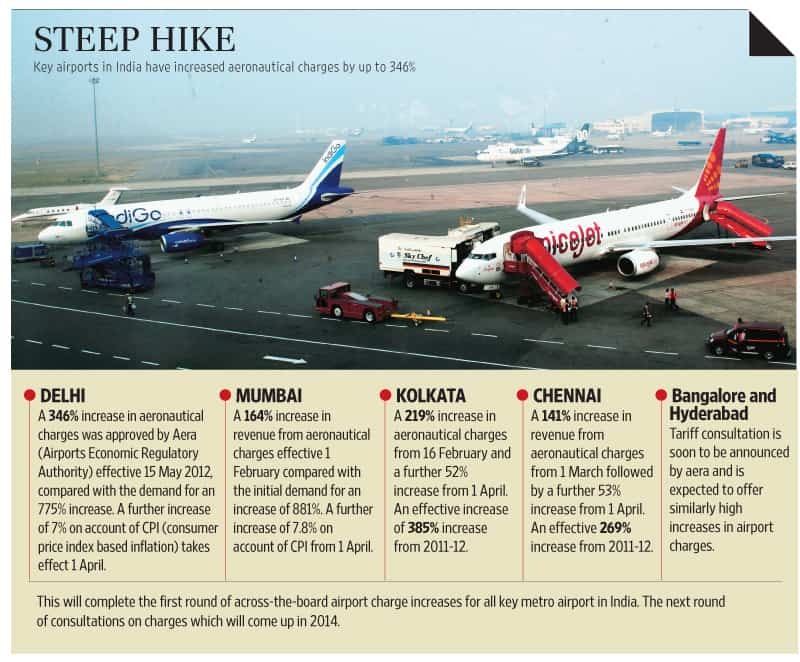 This will complete the first round of airport charge increases for all key metro airports in India before the next round of consultations for such fees in 2014. Malaysian low-fare carrier AirAsia X Sdn Bhd stopped flights to New Delhi and Mumbai from its Kuala Lumpur hub in March citing the steep increase in costs at the two facilities. AirAsia Bhd’s proposed Indian joint venture in partnership with the Tata Group plans to skip high-cost airports such as Delhi and Mumbai, according to airline executives. AirAsia is planning to make Chennai its hub of operations. Indian airports are trying to ensure a 16% return on investment but ignoring the 1% margin that airlines globally operate on, said a senior airline executive, who didn’t want to be named. The airports in India are being short-sighted, said Hormuz P. Mama, an aviation expert and writer. He also pointed out that international airports are tying up with tourism boards to boost traffic to their destinations along with airlines. Nigel Paul C. Villarete, general manager and chief executive officer of Mactan-Cebu International Airport Authority, said his airport in Lapu-Lapu city in the Philippines, which handles 7 million passengers annually, is promoting destinations as per the country’s tourism board. “They understand from where the traffic will come. If they ask us to promote China, we will do so. If they say India, we will be here," Villarete said. Narita International Airport Corp.’s manager, corporate strategies and planning, Katsuichi Samejima, said his government-owned airport was also working in partnership with Japan’s tourism board. A senior executive from GVK Airports Ltd, requesting anonymity, countered that, “Profit or loss, we will have to share our revenue with AAI." He said Delhi airport shares 46% of its revenue with the government while Mumbai airport shares 39%. The executive added that the cost of jet fuel, which constitutes 55% of operating cost, is more worrisome for airlines than high airport charges.